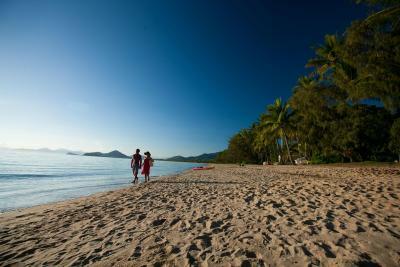 Lock in a great price for The Reef Retreat Palm Cove – rated 8.6 by recent guests! I was so impressed with the position of the resort. It had everything I wanted. The service was excellent. I loved it, would definitely recommend and stay again. Nice shaded location away from the main "drag". Economically a wise choice. We had a studio unit on the ground floor close to the pool. It was very smartly furnished and we had a large king sized, very comfortable bed. We were very happy with our two nights stay and would stay again. Fantastic setting, beautiful spacious rooms with everything you could need for a holiday. Lovely pool and spa, very private. We had our own private balcony and the unit was beautifully furnished. Beautiful resort and the Reef Retreat is possibly the most relaxing place we have ever been! Everything was spot on; can’t fault it and will be back! Big open rooms with well stocked kitchen if wanting to cook things. 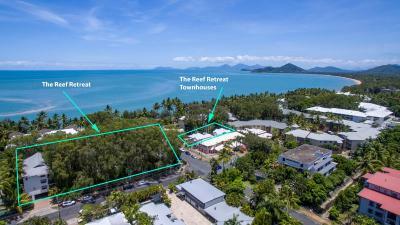 The Reef Retreat Palm Cove This rating is a reflection of how the property compares to the industry standard when it comes to price, facilities and services available. It's based on a self-evaluation by the property. Use this rating to help choose your stay! 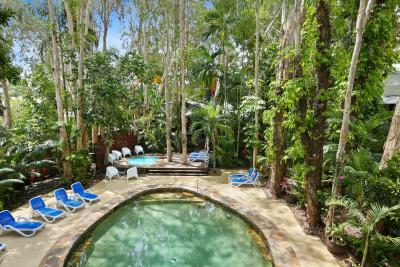 One of our top picks in Palm Cove.Surrounded by groves of paperbark trees, The Reef Retreat has 4-star accommodations just a 1-minute walk from the beach at Palm Cove. All rooms include spacious private balconies with pool and garden views. 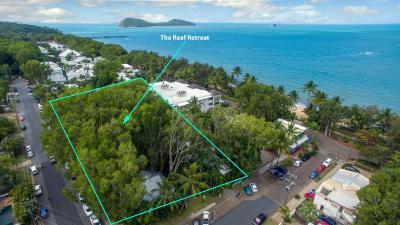 Each room at The Reef Retreat Palm Cove features air conditioning and a flat-screen TV. 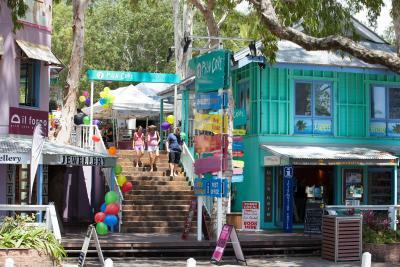 Palm Cove’s upscale restaurants and shops are a short walk away. Facilities include a large heated swimming pool. 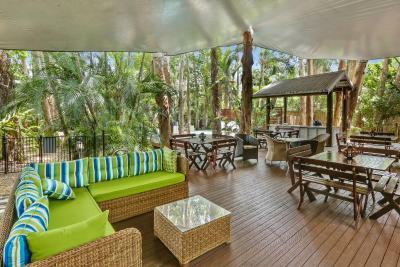 There is an impressive terraced barbecue area in the shade of the surrounding tropical trees. 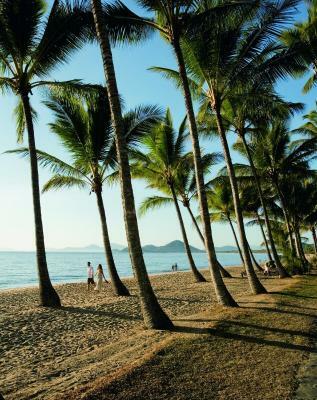 Palm Cove features award-winning dining, boutique shopping and world-class golf. 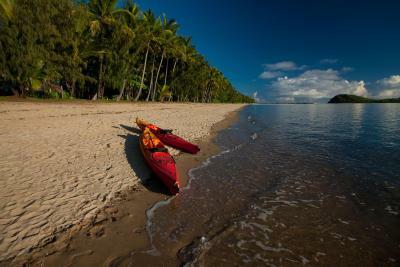 It provides easy access to the Great Barrier Reef, Daintree Rainforest, Cape Tribulation and Kuranda. 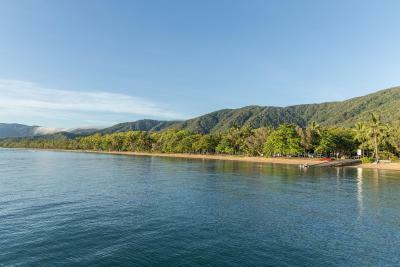 The Reef Retreat is 14 miles from Cairns Airport. Free covered parking is available. 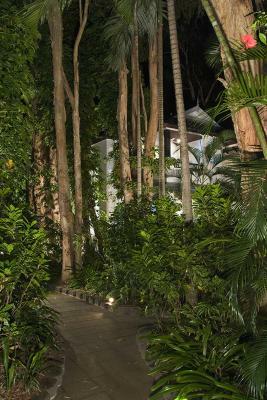 뀐 Located in the top-rated area in Palm Cove, this property has an excellent location score of 9.4! 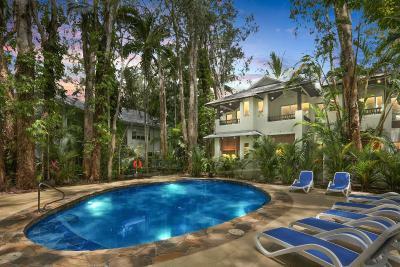 When would you like to stay at The Reef Retreat Palm Cove? 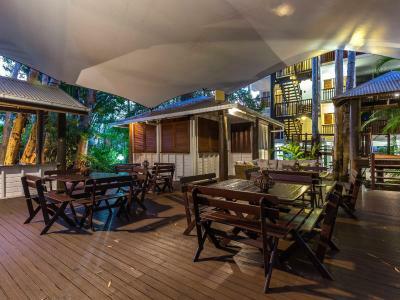 This spacious studio suite is air-conditioned and is set among tropical rainforest. It features a kitchenette with a stove top and a microwave. There is a lounge with a flat-screen TV, DVD player, free cable channels and USB charge points. Free WiFi, an private bathroom, ceiling fans and a private balcony or patio overlooking the pool or tropical gardens are included. The Studio suites are located on the ground and 1st floor. Access to 1st floor rooms is via stairs. This spacious 1-bedroom suite is air-conditioned and is set among tropical rainforest. It features a separate bedroom with bathroom and a kitchenette with a stove top and a microwave. The lounge has a flat-screen TV, DVD player, free cable channels and USB charge points. Free WiFi, ceiling fans and a balcony ideal for outdoor dining are included. The One-Bedroom Suites are located on the 1st, 2nd or 3rd floors. Access is via stairs. 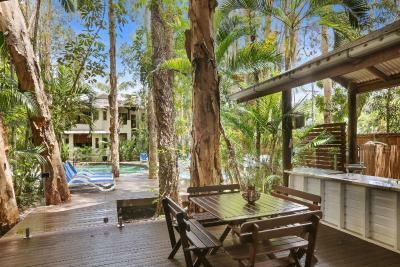 This fully air-conditioned suite is located in a tropical rainforest setting. It features a king-sized bed with a corner spa bath. There is a kitchenette with a stove top and a microwave as well as a private balcony that has a dining area and overlooks the pool or tropical gardens. The lounge has a flat-screen TV, DVD player, free cable channels, USB charge points, free WiFi and ceiling fans. The Superior Spa Suites are located on the ground or 1st floor. Access to all rooms is via stairs. Set among tropical rainforest, this air-conditioned, spacious, self-contained apartment features 2 bathrooms, 2 separate bedrooms, 1 with a spa bath. It also includes a fully equipped kitchen with a dishwasher and a microwave. A lounge with a flat-screen TV, DVD player, free cable channels, USB charge points and free WiFi are provided. Laundry facilities, ceiling fans and a large private balcony with a dining area is included. The Two-Bedroom Apartment is located on the 3rd floor. Access is via stairs. This spa suite is air-conditioned and is set among tropical rainforest. It features a king-sized bed and a corner spa bath as well as a kitchenette with a stove top and a microwave. There is a dining setting on the balcony. The room has a flat-screen TV, DVD player, free cable channels, an USB charge points and there are ceiling fans. Free WiFi is provided. The Standard Spa Suites may be located on the ground, 1st, 2nd or 3rd floor. Access is via stairs. Standard spa suites do not have views of the pool or gardens. Set among tropical rainforest, these interconnecting suites feature air-conditioning. Each separate suite has an private bathroom, DVD player, USB charge points, free WiFi, ceiling fan, flat-screen TV with cable channels and a kitchenette with a stove top and a microwave. Each suite has its own balcony, ideal for dining. Two-Bedroom Suites are located on the 1st, 2nd or 3rd floors. Access is via stairs. 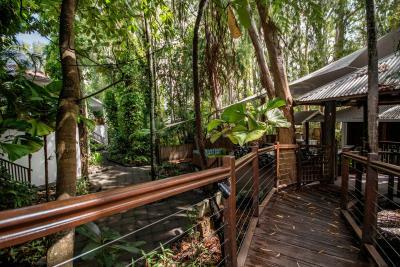 The Reef Retreat offers an idyllic sheltered Rainforest setting, coupled with a variety of tastefully decorated self-contained apartments. 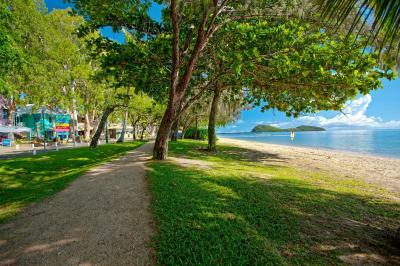 Yet, only 50 meters from the sandy beach of and restaurant rich esplanade of Palm Cove. 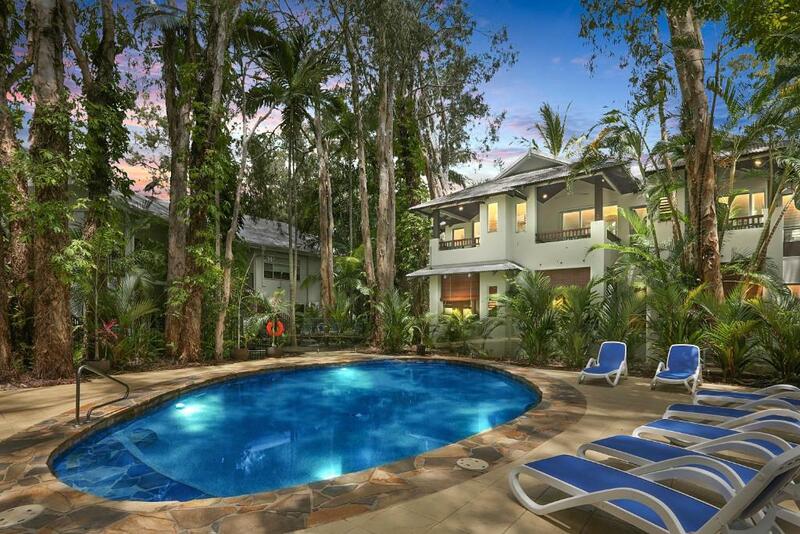 House Rules The Reef Retreat Palm Cove takes special requests – add in the next step! One child under 16 years is charged AUD 35 per night when using existing beds. 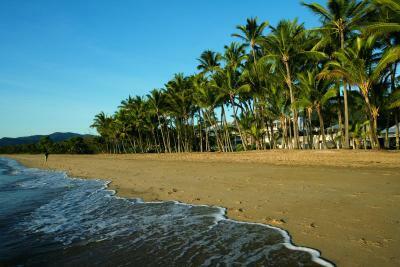 The Reef Retreat Palm Cove accepts these cards and reserves the right to temporarily hold an amount prior to arrival. Please note that there will be contractors on site from 03.12.2018 until 09.12.2018 between 7:30 am and 05:00 pm due to minor renovations. Please contact the property for further information. The Studio, One-Bedroom Suite, Superior Spa Suite and Two Bedroom Villas are serviced once during a 5-night stay. Please note that stays of 4 nights or less do not include a service, but this can be arranged at an additional charge. Clean towels are available upon request from reception on days when the room is not serviced. Please note that early departures will still be subject to full charge. Nothing I loved everything about this resort. I loved our the room, very roomy and the kitchenete was great, the bed was really comfortable and especially loved the pool and spa area, swimming in the poolI felt like I was in a tropical rainforest. Wet season was the best time to come, sunshine sometimes, rain showers the next. Close to the shops and restaurants all walking distance. Defiantly be coming back. Staff weren’t that friendly or welcoming but they still did their job well. Great vibes, facilities and location. Spa bath was excellent, full kitchen, fridge and a massive bed. Also a hot tub, pool and so close to the beach and surrounding cafes and shops. Pool was on the small size and surrounded by trees which some what blocked out the sun. I can understand it for non sun lovers but I think they could do with a bit of thinning out, We like the sun. Room serviced only once in 7 nights stay. No real interaction with other guests, there was a common area but the bar was not open, was this due to time of year? Room size for an apartment, good size bed, good aircon, design of the apartment area. Guest laundry on site. Layout of gardens. Well located and well appointed units. Lovely pool and surrounds. Close to all restaurants. Cant think of anything I didnt like. Location was great. Our room was a generous size with everything we needed. Kitchen out on balcony which was a great idea so it didnt heat up room when used. Didn’t like the bed, having two singles placed together, with a high firm ridge in the middle. Much prefer a standard queen. Great pool and deck within forest environment, top location a few steps from the beach, good room, staff with helpful/pleasant/relaxed attitude. Would be happy to stay in the future. Noise from pool outside room.